Contrary to what many people think, getting great lighting in an office or workplace environment doesn’t just happen by feel­­—there’s a science to it. 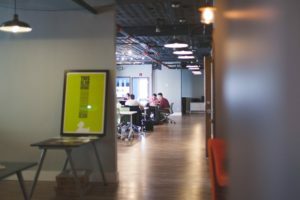 If you’re thinking of using new energy-efficient LED lights in your office spaces, you really need to do the math to make sure employees get enough light to help them see what they’re doing, stay safe, and be productive. Whether you’re retrofitting the lights in an office or factory floor, here are a few basic steps to figure out how much light, or how many light bulbs, you will need in these spaces. Lumens – A lumen is the actual unit of light produced by a light bulb (or any light source for that matter). This is commonly referred to as “light output” or brightness. For a reference point, a 100-watt light bulb emits around 1,500 – 1,700 lumens. Watts – Many of us equate watts with brightness, but a watt is not a measure of light produced by any light source. Instead, a watt is a measure of power—more commonly known as electricity. So, if an incandescent bulb has 100 watts on the label, this means it uses 100 watts of electricity if switched on for an hour. Knowing this difference is important, because an LED and an incandescent bulb that are both rated at 100 watts produce vastly different levels of light. 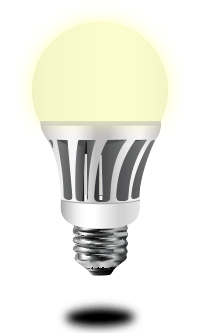 The good news is that many manufacturers of LED lighting place the “Watt Equivalence” of their devices on the label to help buyers who are more familiar with traditional lighting figure out which LED would replace a 20-watt, 40-watt, 60-watt, or 100-watt classic bulb. For example, a 10-watt LED light bulb could have “100-watt equivalent” on the label. Now that you know the difference between watts and lumens, let’s move to the more challenging part: figuring out how many light bulbs to use in a room. Figure out the room’s square footage. To calculate this number in a rectangular area, measure the length and width of the floor and multiple those two numbers—this gives you the area in feet squared (ft2). Determine the foot-candle requirement of the room. A foot-candle measures the brightness of a light one foot away from its source. It’s important to note that different rooms have different foot-candle requirements. For example, 20 foot candles are often recommended for general office spaces, 10 foot candles are appropriate for conference rooms, while work areas need as many as 50 foot candles. Proceed to calculate the number of lumens needed in a room. Simply multiple your room’s square footage with its foot-candle requirement. So, a 250-sq. ft. conference room needs around 2500 to 5000 lumens, which should be enough light for people to see each other clearly. In terms of the number of light bulbs, you can install 10 500-watt LEDs to meet this requirement. Note that this rule applies to typical conditions. Factors such as the color of your walls, floors, and office furniture, as well as the use of fixtures with shades, will make a room look darker—you can tack on an additional 10 lumens per square foot to compensate. In addition, if your room is lower or higher than eight feet, you will need to reduce or increase your lumens-per-square-foot requirement accordingly. And if you want your office lights to be especially bright, you can increase your calculations by 20 percent.